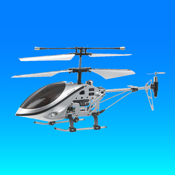 This app can control the helicopter after you connect the transmitter to the audio jack of ipod touch or iphone. 1. On the left screen: This is helicopter's throttle, it can fly the helicopter in the air by move forward and land the helicopter when you move backward of it. 2. On the right screen: This function can control helicopter's direction, you just need to move it to up, down, left or right. 3. On the center of the bottom screen: You can use this trimmer to adjust the helicopter to left or right when the helicopter is keep rotating in the air. 4. On the center of the screen: Press "On" to start the controller; press "off" to turn off the controller. 5. On the upper right corner: You may turn on/off the g-sencer to control your helicopter.